I’ve been in a crazy overnight oats phase lately. That’s all I ever want to eat for breakfast, and I start craving it the moment I put the container in the fridge the night before. The possibilities are endless with overnight oats, all you need is a base and you can then top it off with absolutely whatever you like. My most recent type is Dr. Bircher’s classic recipe. It’s been done for ages and never ever gets old to me. 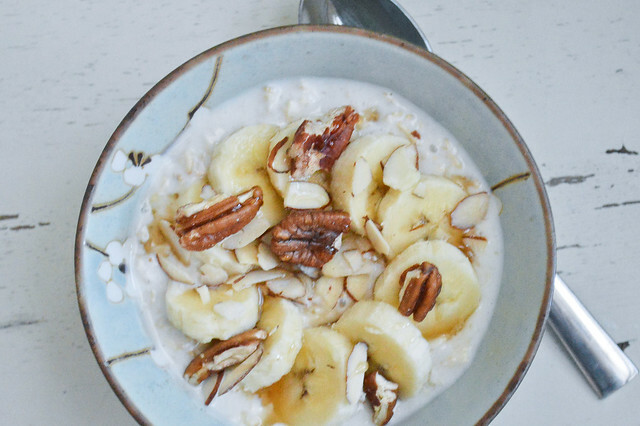 It’s a healthy, tasty and filling way to start your day. This also makes a great on-the-go breakfast, as you can just grab your jar out of the fridge and leave if you’re on a run. Bon appétit! The previous night, mix the oats, the milk and the yogurt together in an airtight container. Place in the fridge and let the oats soak overnight. The next morning, grate the apple, sprinkle with lemon juice and incorporate to the base. 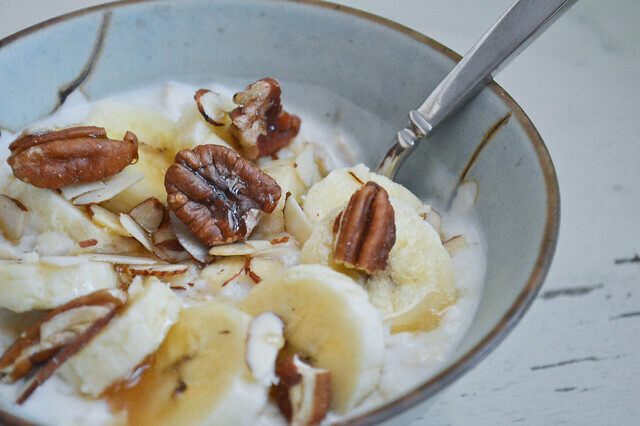 Top with a drizzle of maple syrup (or honey), 1/2 banana (sliced) and sliced nuts or granola. TIP: If you like your muesli sweeter, you can substitute the plain yogurt for vanilla flavored one, or use a ratio of 1/2 condensed milk 1/2 almond milk instead of plain almond milk. Alternatively, you can use fresh mixed berries instead of the banana, but be sure to keep the apple as it smoothes out the overall texture of the base. Not surprisingly, I love food blogs! Which isn’t breaking news considering I have my own. What I mean by that, is that I also spend a ridiculous amount of time reading a lot of them. Seriously though… They’re addicting! I find it way more entertaining than watching TV, or stalking people on facebook. It’s such an amazing source of inspiration! Among my favorite ones, is Heidi Swanson’s 101cookbooks. If you’ve never been on it, you should definitely take a look and I promise you won’t be disappointed. I actually like it so much that I also bought her book. 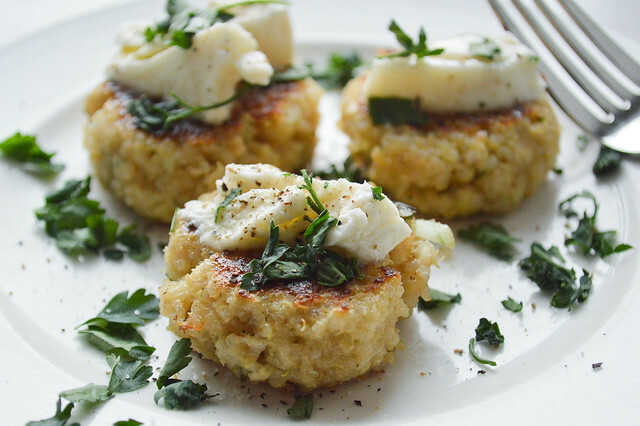 This quinoa patties recipe is one of my favorites. It’s so perfect that the only changes I made are to use a different cheese and type of herbs. It’s a great quick meal if you have leftover cooked quinoa in your fridge, and you can keep the batter for an extra couple of days and cook the patties to order. Bon appétit! In a large bowl, mix the cooked quinoa with the eggs and salt. Next, add the grated cheese, onion, parsley, garlic, and breadcrumbs. Mix well and let the batter sit while it absorbs the liquid. It should be moist, but it should easily hold. Next, form patties and heat olive oil in a pan. Cook the patties for about 7 minutes, or until golden brown. Flip them over and cook for about another 7 minutes. Top with a mashed avocado, good olive oil, fresh mozzarella or chopped tomatoes. Salt and pepper to taste, and drizzle with tabasco. TIP: These patties are delicious on their own, but a variety of toppings take them to the next level! I always mix and match them and eat the patties with a big bowl of salad! Finally, this dish leaves you full and packed with energy, as chickpeas are an excellent source of protein (and fiber!). Don’t be intimidated by the long list of spices, I found them all at the grocery store down my street. Bon appétit! Start by cooking the coconut rice. In a small pot (or a rice cooker), put the dried rice with the coconut milk and the water. Give it a good stir, and let the rice cook until it has absorbed all the liquid. This should take between 10-15 minutes. Meanwhile, sauté the chopped onion in olive oil, over high heat. When it becomes brown, add a splash or water, turn the heat to medium, and stir until the liquid evaporates. This should take about 5 minutes. Next, add the cooked chickpeas and all the spices. Give it another stir for about 1 minute. Add the coconut milk, water, tomato paste, salt (to taste), and stir until everything is combined. Bring to a boil and then reduce to a simmer. 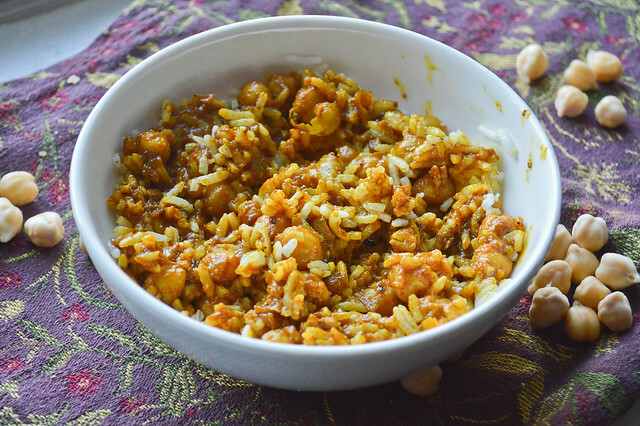 Let it cook for about 20-30 minutes, or until the curry thickens and reaches your desired consistency (add water if it gets too thick, or let it cook for longer if it’s too liquid). Adjust the seasoning. 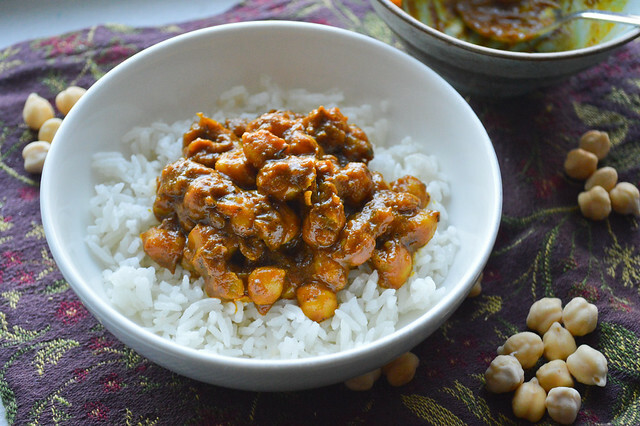 To serve, put the coconut rice in a bowl and top it with the chickpea curry and a good amount of sauce. 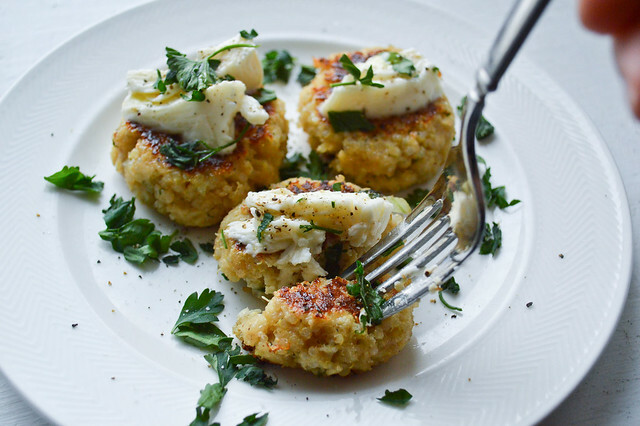 TIP: You can use a mix of chickpeas and cauliflower for added flavors and texture. It’s peasto time! 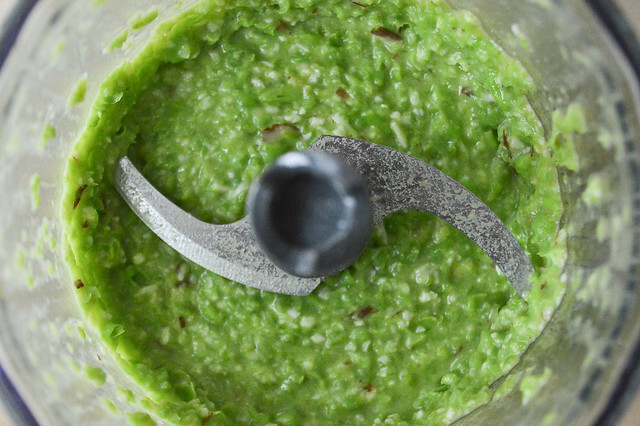 In case the title wasn’t explicit enough, this is a recipe for a homemade pesto made with sweet peas. I’d been thinking about it and lurking at my huge bag of frozen peas for a little while before I actually decided to give it a shot. Since I had a little extra time this week end, I finally got to try my hands at it and tweak a recipe to make it just the way I like it. Let me tell you up front that I’m now obsessed with it. So obsessed actually, that I tend to just eat most of it out of the bowl while the pasta cooks. I just spread it on toasted bread instead. And oh how good it tastes… Once the pasta is done though, I still toss it with what’s left of the sauce. It’s absolutely delicious once topped with fresh grated parmesan! 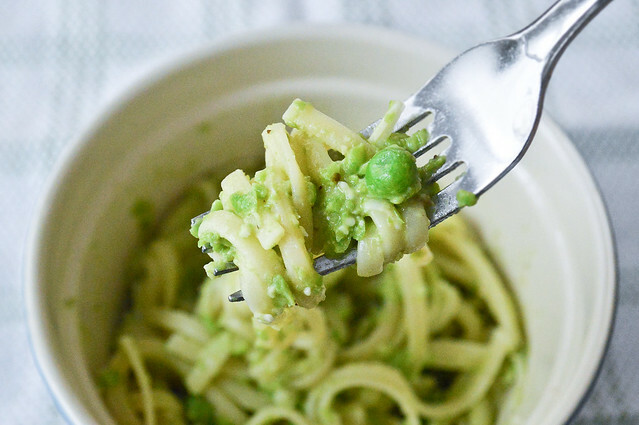 This peasto is a little sweeter than your typical basil pesto and definitely makes for a refreshing change! Bon appétit! Bring salted water to a boil in a large pot, and cook the pasta for the time written on the packaging (mine takes about 10 minutes). Meanwhile, in a microwave-safe bowl, cover the frozen peas with water and cook for about 1:30 minutes. Drain, reserve about a spoonful, and place the rest in a food processor. To make the “peasto”, add the garlic, the almonds, the olive oil, the parmesan and some cooking water from the pasta to the food processor. Mix until the sauce is smooth and homogenous. If it’s too thick, add some more pasta water until you reach a better texture. 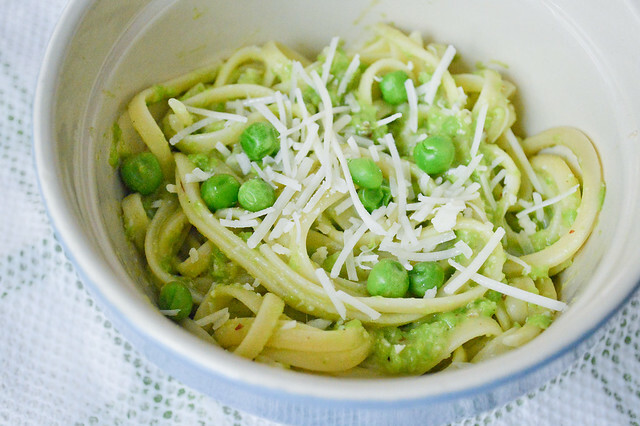 Drain the pasta and put it back in the pot, toss with the peasto, adjust the seasoning, and top with extra parmesan cheese and the spoonful of reserved cooked peas. TIP: you can substitute the almonds for pine nuts if you have some on hand. Additionally you can add a bunch of fresh herbs while mixing the pesto. Basil or mint are my favorites for this dish! Lately, eggplant’s been at the top of my vegetables crush list. Seriously though. I don’t know why I love it so much, but I can eat it three times a day. Ok, maybe not for breakfast. But definitely for lunch and dinner. I use it in sauces, stews, dips or even just on its own, and I never get tired of it. This time though, I chose to stuff it with a delicious couscous mixture. It turned out to be an ideal dish for dinner. 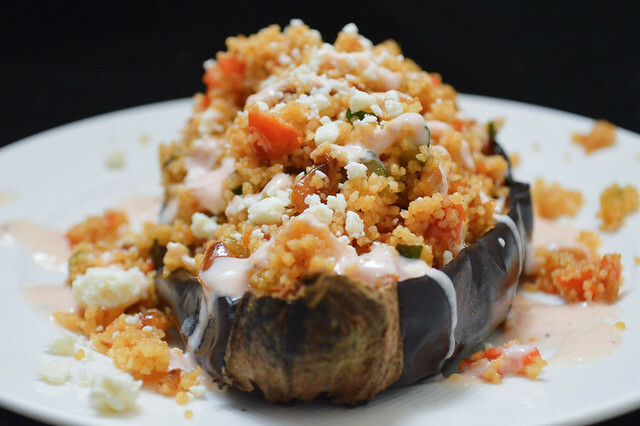 Stuffed vegetables appeal to me because they can be transformed in many ways. The combinations of grains, meat or stuffing with their tender roasted flesh always make for satisfying and diverse meals. 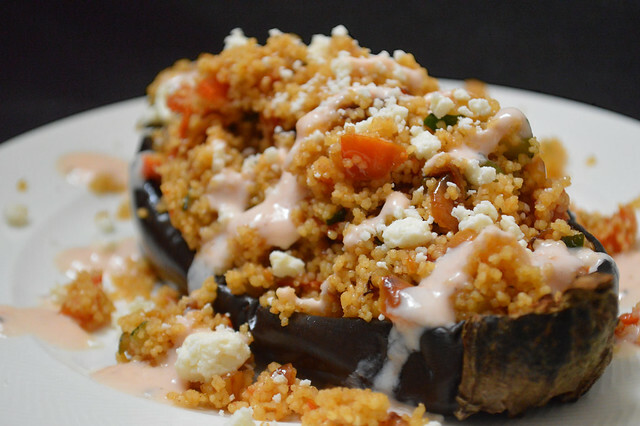 Here, the paired eggplant and couscous offer you plenty of good nutrients in a tasty fashion. Bon appétit! Preheat the oven to 400°F. Scoop (and save) the seeds out of your eggplant half, leaving about a 1/2in border, drizzle with olive oil, sprinkle with salt, and roast flesh-down for about 30 minutes. As the eggplant roasts, make the lemon-yogurt sauce by mixing the lemon juice and zest with yogurt, water, salt, pepper and a splash of sriracha. To cook the couscous, bring 1/3 cup water with 3/4 tbsp of butter to a boil. Cut the heat and add the dried couscous, stir well, and let it sit for about 5 minutes. Then fluff it up with a fork (timing instructions may vary depending on the type of grain). Meanwhile, sauté the onions with olive oil, on high heat, in a small pot for about 5 minutes. Add a splash of water and let it evaporate to further soften the onions. Add the chopped cherry tomatoes and diced zucchini, and cook for about 5 more minutes on medium heat. Once the couscous is ready, add it to the pot and stir well so that all the ingredients are well incorporated. Sprinkle with chopped parsley and crumbled feta and adjust the seasoning. 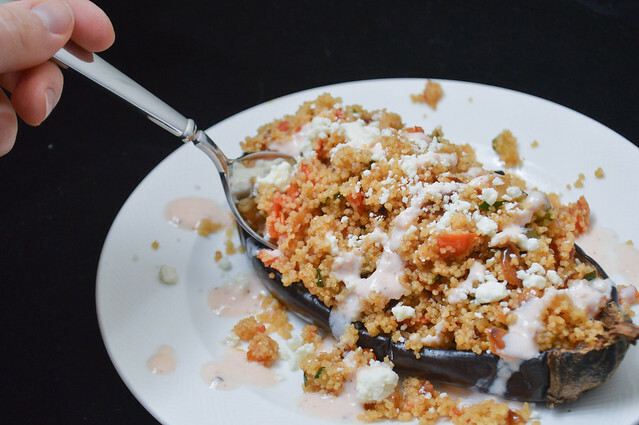 Once the eggplant is fully roasted, scoop the couscous mixture in it. Drizzle with the spicy lemon-yogurt sauce and eat with a spoon! TIP: you can substitute lentils or quinoa for the couscous if you don’t have any on hand.